How big is your room in the House of Representatives? 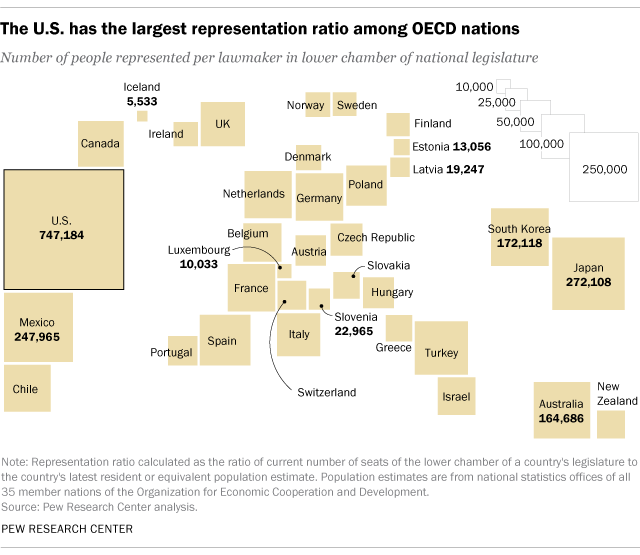 The average member of the U.S. House of Representatives represents how many people? How accurate do you think the average American’s prediction would be? What portion of Americans even know there are three branches of government? What trend do you see in the data in the chart above? Describe one cause of that trend. Explain one consequence of that trend. What is one negative consequence of having so many people per congressional district? There is currently a cap on the membership of the U.S. House of Representatives at 435. Do you think that cap is a good idea? Imagine you wanted to change the 435 member cap. What method would you need to use to make that change? Explain why that change be difficult to enact. Explain which is more democratic, representation in the U.S. House or representation in the U.S. Senate. Thanks to @MrSautters @RAPLewis @MCMartirone for their ongoing support and for the inspiration for today’s class starter. Read the Pew Research Center’s report about U.S. House district size, U.S. population keeps growing, but House of Representatives is same size as in Taft era. Contact your U.S. House member, let them know what you think about the House’s 435 member cap, and ask them what they plan to do about it. Share your correspondence in class, online, or in a classy oil painting!!!! The first Congress (1789-91) had 65 House members. A 1929 law authorizing that census also capped the size of the House at 435. And there it has remained, except for a brief period from 1959 to 1963 when the chamber temporarily added two members to represent the newly admitted states of Alaska and Hawaii. One proposal to add seats to the House is the so-called “Wyoming Rule,” which would make the population of the smallest state (currently Wyoming) the basis for the representation ratio. Depending on which variant of that rule were adopted, the House would have had 545 to 547 members following the 2010 census.